Tennis League Network Blog: Who's who in the TLN Community. Who's who in the TLN Community. More than 7,000 players are part of our tennis league network. Some people have been members of their local group for several years and may have played each other several times by now. It’s always nice to know something about your opponent. From time to time we’ll post profiles of members in the various online communities. Even if they are not in your local league, they may have something in common with you. Or something they say about their own tennis game may resonate with you. What's certain is that you will learn something positive about Tennis League Network. Amy Kraus, who plays in Boston Community, is our first profile. 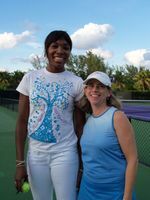 Amy Kraus (left, with Venus Williams) had been playing tennis for five years when she saw a flyer for Tennis League Network’s TennisNorthEast online tennis community posted at a court near her home in Boston, MA. She’s been a player with TennisNorthEast ever since—and that was five years ago. Amy has not only found other singles players, but enjoys playing “the same people year after year, and developing relationships with them.” So, Amy, do you have any League rivalries? Amy does make the most of it. She plays tennis two and sometimes three times a week. “It’s made me a better all around player,” says Amy, who currently plays at 3.0 level, but hopes to become a 3.5 player. Tennis League Network Hits the Airwaves. Your Kickoff Day is Coming Soon.